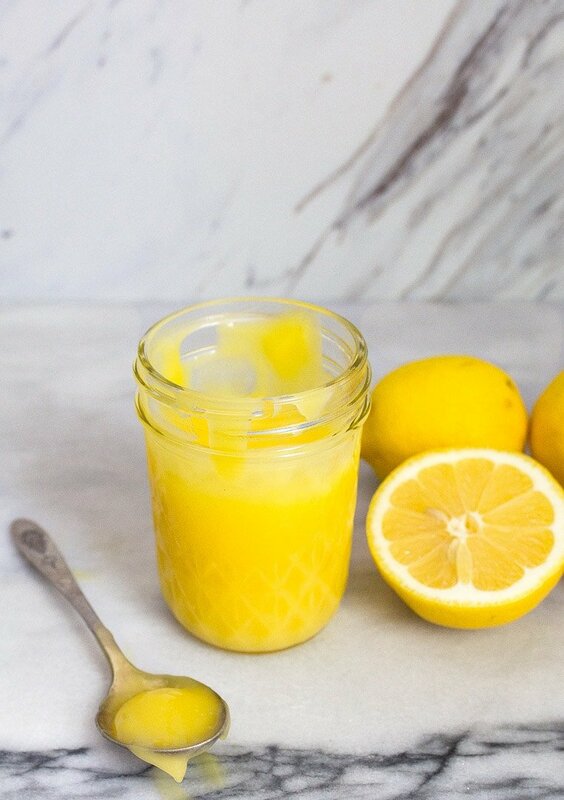 Microwave lemon curd- small batch recipe that uses just 1 egg. I’ve confessed this to you before, but I’ll say it again: I’ll take a lemon dessert over a chocolate dessert any day. I know it’s weird; I know something is probably wrong with me. But, it’s just the way I am. The fun thing about loving lemon so much and being a recipe developer/ cookbook author/ baker is that when I make a chocolate dessert for two to share with you, it’s gonna be GOOD. Mind-blowing, even. I promise. My small-batch brownies for two are killer, my chocolate gooey butter cookies will make you weak in the knees, and my mini chocolate cake for two will be on semi-weekly rotation at your house after just one bite. What I’m trying to say is, when I make something with chocolate, it’s freaking fantastic, because honestly, I’d rather be eating this microwave lemon curd. If a chocolate dessert can tempt me away from the lemon curd, it’s a winner. This lemon curd is everything I’ve been searching for in a lemon curd for years. It’s silky, sweet and tangy all at once. And best of all, it only takes 5 minutes to make! I’m very picky about lemon curd, because most of it is overly egg-y tasting, do you know what I mean by that? Any kind of canned/ packaged/ pre-made lemon curd always tastes like eggs to me. If I wanted lemony scrambled eggs, I’d make that. But I don’t, and you probably don’t either. We want a smooth, creamy luscious sauce that is sweet with a lemon pucker at the end. It should be bright and tangy yet silky and creamy. So, if you want really good lemon curd, you have to make it yourself. You know this. But, most lemon curd recipes make a few cups, which is fine if you’re feeding a crowd, but what if you’re just feeding a Tuesday night craving? Enter my microwave lemon curd that’s made in just 5 minutes with just 1 egg. It uses the entire egg, so no leftovers! The key to an amazing lemon curd is fresh lemon zest. Lots of lemon zest! Here’s the exact the microplane grater that I used in the video, because freshly grated lemon zest is the key to great lemon curd. I don’t think that any store-bought/ canned/ packaged lemon curd has fresh lemon zest in it (which is exactly what’s wrong with all of those products). Grate the zest of your lemon, juice it, add an egg and some sugar, and then microwave it. It’s almost like a miracle. A miracle in the microwave. I have a newer model microwave that took 2 1/2 minutes on HIGH to make this lemon curd, but I also shared in the video the best way to know when your lemon curd is done–your microwave might take more or less time to set. Check the comments below from others who have made the recipe to see how long it took in their microwave! Yes, it will thicken as it cools. Spread on homemade graham crackers. 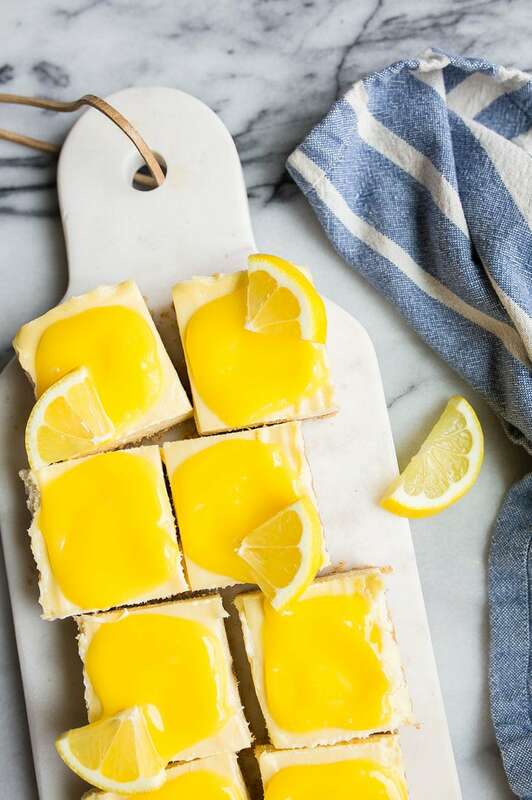 I love this microwave lemon curd over my lemon cheesecake bars (pictured above) the most! Have you made those yet? There’s hardly a Spring dessert that isn’t made better with this easy, fast microwave lemon curd. Enjoy this recipe! Microwave lemon curd made in just 5 minutes with 1 egg. In a microwave-safe bowl, whisk together all of the ingredients very well. Microwave on HIGH for 1 minute. Stop, stir, and then microwave another minute. Stir the lemon curd after 2 minutes, and then place it back in the microwave for a final 30 seconds. 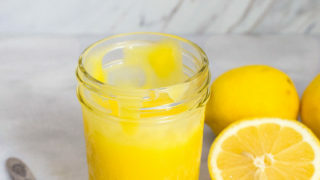 After 2 minutes and 30 seconds, begin testing the lemon curd by quickly dipping a spoon into it, and running your finger through it. If the line holds, the lemon curd is done. If the curd runs and fills the line you just made, try another 30 seconds in the microwave and test again. The curd will thicken considerably as it cools. Strain the curd through a fine-mesh strainer into a jar with a lid or small bowl (cover with plastic wrap directly on the surface of the curd if you're using this method). Place in the fridge, and use within 7 days. I don’t have a microwave, is there a way to make this on the stove? I can’t wait to try this. I am with you on the lemon over chocolate camp too, 3 out of 4 in our house would choose lemon over chocolate. I love that this doesn’t make a ton, uses only 1 egg and I don’t have to babysit it on the stovetop. I didn’t see the link for a video, am I missing it? Thank for not making me feel weird about loving lemon more that chocolate, while still being in your 30’s. I’m team lemon curd as well, I’ll take hat over chocolate any day! Lemon lovers unite! I love how easy this is to make! Lemon curd always sounded intimidating to me (though I LOVE lemon desserts too!) We’ll have to give this a try for a tangy summer dessert! Should the butter be cold? Melted? Room temp? melted, sorry, I’ll clarify. The video states melted, but the recipe does not. Fixing now! Good catch, thank you! Can I use limes also for lime curd. OMG. This is genius! and dangerous. . . I love lemon. As a lemon curd lover intimidated by lemon curd recipes, this sounds like a DREAM. Except I don’t have a microwave. Is there any way this can work on the stovetop? Do you have any suggestions on a substitute for the one egg!? This looks sooo yummy! I don’t Kat, I’m so sorry! It really needs the egg. Have you tried any of those egg substitute powders? I saw some at Sprouts the other day, but haven’t tested them. I had two egg yolks leftover from a recipe that I wanted to use. This was a perfect template, I just reduced the other ingredients a bit to adjust for less egg and it turned out perfect! Thanks! Love lemon anything! But one of my favorite pairings is lemon ice with fresh strawberries. So why not use this lemon curd as a dip for fresh strawberries? No brainier! Thank you for developing these fabulous small-batch recipes! Mine came out good, but there were some lumps from the egg whites. What can I do to avoid lumps next time? Thank you for this recipe! The flavor is great! I love that it was easy and plenty for me and my bf to enjoy. Do you think this could be easily doubled? I’m making a lemon birthday cake at a friends request and I need 10 oz of curd per layer so I thought I could double the recipe for each layer and have a little leftover for personal use! This is fantastic and just perfect for my needs. Thank you, Christina! I made this today! With your homemade graham crackers (I cut mine into squirrel shapes). The graham cookies will take a bit to perfect the thickness but the lemon curd? That sweet, sweet, smooth, tangy, velvety yum, that will be a new staple on my comfort food list. Thank you, thank you, thank you. Excellent recipe. As are all of Christina’s recipes I have tried so far. But don’t be like me and try to only use one bowl for the melting of the butter and the cooking. Definitely mix your egg and sugar well before adding the butter and lemon juice. I ended up with little bits of solid egg white that needed to be fished out. An extra bowl to say is well worth it. Melt your butter separately. You’ll be glad you did. I love lemon curd. I made your recipe today. The flavor is amazing but it was grainy. Should it be left at room temperature to cool? I refrigerated it immediately. I will keep trying though this was so much easier than the double boiler method. Hi, I’m currently making this on the stovetop as putting it in the microwave on high literally made it boil! Should I try microwaving on low next time? Hi Amanda, thanks for writing! Can i ask why you’re making it on the stovetop and the microwave? Why both? Either make it in the microwave as the recipe states, or on low on the stove as an alternative. I haven’t tried making it on the stove, I’m just suggesting it as a possible method for those that don’t have a microwave. Hi again, I didn’t actually intend to use both methods, I meant that I tried making it in the microwave as stated and it kept trying to boil over the edge of my bowl— so I took it out, poured it into a small pan and cooked it on low on the stovetop instead since I really didn’t want to have to clean a huge mess out of the microwave ???? It turned out delicious but I’m not sure why it didn’t work well in the microwave. You said to microwave it on high but maybe that setting can vary widely across microwaves? Ohhhh, I see! Ok, when I made it (you can see my bowl is pretty deep), I didn’t notice it furiously boiling at all. I’m wondering if your microwave is hotter than mine? If you’re up for it again, try it stovetop only? Just finished making this and it is delish! Perfect if you need a quick lemon curd fix and don’t want to spend the time stirring over a stove. Thanks, Christina! Hi Christina…Have been following your posts on IG for sometime now and have tried some of your recipes..you make making fancy desserts sound so easy and most of them are a breeze to make, including this liquid gold! I’m completely nuts about lemon (would live my life without chocolate but the guests would always go hungry then) and lemon curd is on the top of my list. Somehow getting a commercially made jar of lemon curd is not alluring enough and the hassles of making it with the double boiler method is just too much effort. The microwave method is such a brilliant idea…And I think that because the setting of my microwave is much higher, I got a cup full of sunshine in less than 2 minutes :) Now onto that lemon cheesecake to do justice to lemon curd. Can you use Splenda for the sugar? I haven’t tried it, Carol! Is it a 1:1 substitution typically? Thank you, thank you, thank you! This is amazing and so very simple. I adore lemon curd, as does my 6-year old (who pleads for it all the time), and sometimes I want it fast and store-bought never cuts it. And now that the weather is so warm and the kitchen is hot) I can make it without turning on the stove! This tastes fabulous and with the first batch turned into an icebox cake, the second batch is in the fridge for eating on its own. Team lemon all the way. 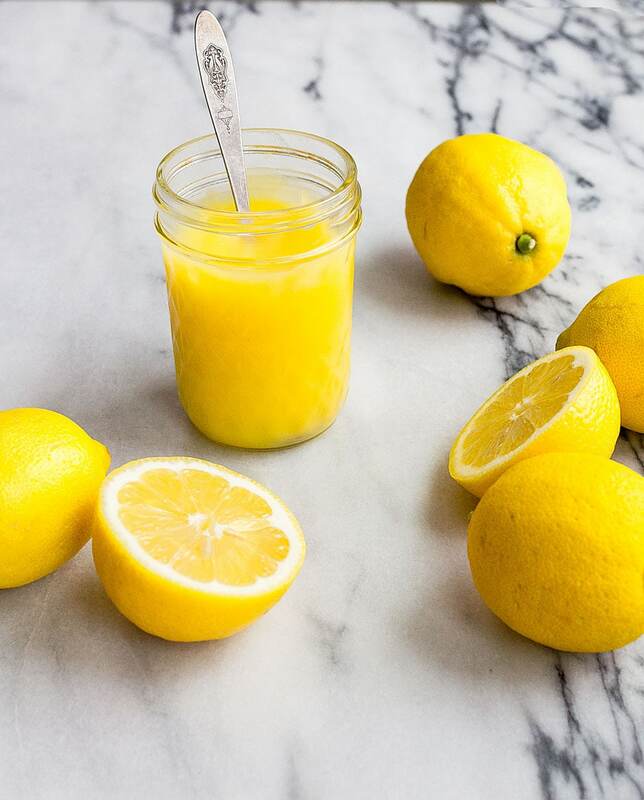 Thank you for this most amazing and simple recipe for lemon curd. Takes sway the headache of stovetop cooking. I also follow a lot of your other recipes. Love them all. Thank you for this amazing and simole recipe. So dreaded making it on the stovetop. I also baje a lot of your sized down cakes. All turn out excellent . I was wondering if the measurement of that lemon curd recipe that it’s enough for a pie, and if I need to do the microwave process before add to the pie and bake it, or if I could put the lemon curd “crude” in the pie and bake it after. I made this according to the recipe. It actually boiled over in my microwave during the 2nd one-minute interval so had quite a mess, salvaged some, strained it because lots of little eggy pieces were in it, and it tasted good. Thankfully I was just using it on a 6-inch lemon cheesecake so I didn’t need much anyway. If I did it again I’d try 1 minute first and then 30 second intervals because perhaps my microwave has more power than recipe’s. Oh no, Cece! I’m wondering if you used a smaller measuring cup than I did? Or maybe your microwave runs hot? Is it a newer model? Mine is new.